Experience flawless colour and contrast with intense black levels in our QLED Q85R 4K TV. And realise clutter free living with just One Near-Invisible Cable. Real colors like life itself. Thanks to Samsung's exclusive Quantum dot technology, QLED TVs reproduce 100% of the volume of color, showing bright and dark scenes with any level of brightness. We present a new level of precision. Every detail comes to life thanks to the Direct Full Array Premium, which offers a highly realistic image by controlling light with total precision. Enjoy, scene after scene, from a depth never before seen. Get ready for an experience so far not seen on Samsung QLED TVs. The new QLED TVs use automatic learning using Artificial Intelligence to improve the image and sound at 4K quality. Discover QLED Quantum 4K processor. Its unique algorithm offers clearer images, adjusts the brightness of the screen and sound to suit your space and playback content. 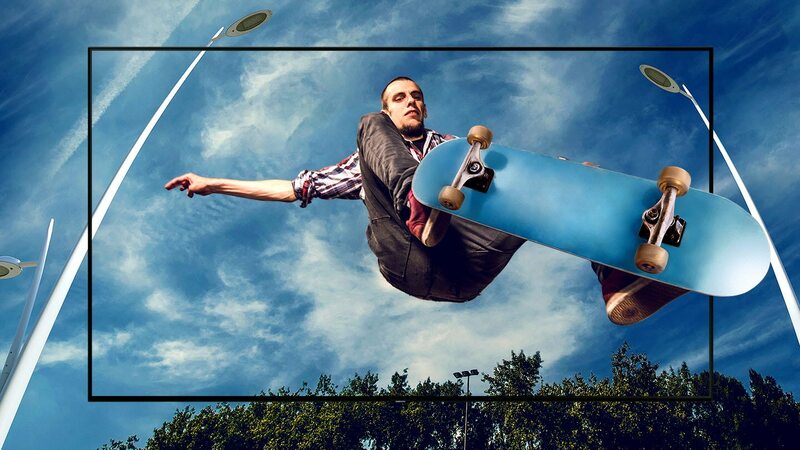 Discover the improved resolution thanks to the new TV processor. The Q HDR 1500 technology creates deep contrasts and amplifies the brightness, allowing you to observe the stars as they are. The time has come to light up your living room. Everything becomes more real in your big inch QLED. Live each goal, feel each explosion and you will be transported right to the center of the action. You have never been so close. Forget about fighting for the best place on the couch. The new QLED television distributes light evenly, reducing leakage, to provide a spectacular viewing experience from any angle. The purity and intensity of the colors are maintained regardless of where you are sitting. A well-designed television should focus your attention on what is important: the image. The infinite design of the QLED TV enhances the immersive effect thanks to its almost imperceptible frame so that you focus all your attention on the content. QLED is even smarter thanks to Smart TV and Premium remote control. Easily access all your content from any device, from the decoder to the console, applications or live TV. You only need a single command. Less searches, more fun. Universal Guide of QLED makes you recommendations of the programs and contents adapted to your tastes. Find your favorite content quickly and easily. Now you can talk to your QLED. Bixby is a personal assistant that does much more than control your television. Ask and you will receive. Unify all your cables in one, including the current. The almost invisible connection will allow you to camouflage your devices, connecting them directly to One Connect. 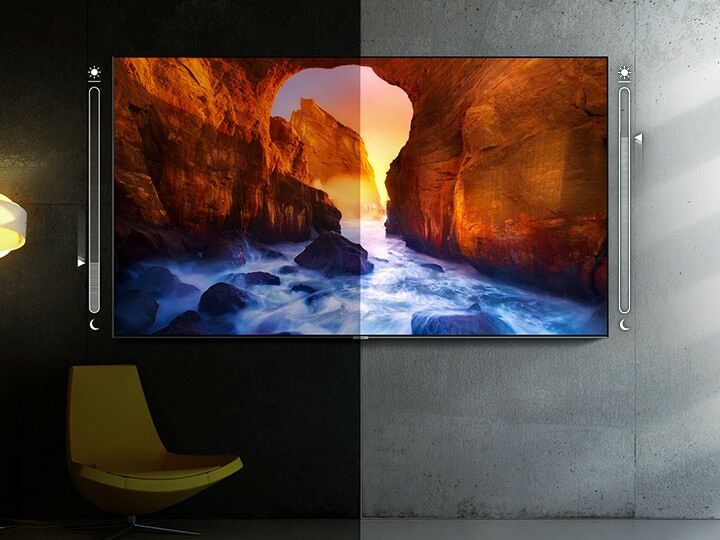 The result is a uniform surface that hides the TV cables, integrating it perfectly in your home. Enjoy the most minimalist experience. The Ambient Mode of the QLED TV is integrated into the decoration of your home naturally. Instead of seeing a black screen, you can enjoy images adapted to your lifestyle. It is very easy to configure through the SmartThingsTM app and has many options. To win others you need total control. The Black Dynamic Equalizer gives you better visibility in the dark and employs a detailed scene analysis to optimize the quality of the image. It also improves the sound so you can immerse yourself completely in the game. The new QLED TVs work with Google Assistant to make your life easier. Change channel, adjust volume, control playback and much more using only your voice. The conditions of your space change and your TV should adapt to them. Intelligent QLED mode adjusts brightness and volume automatically. You can also adapt the sound to the content you are watching, for example, by removing ambient noise in the dialogues of news programs and highlighting the singer's voice at concerts. The Ambient Mode of the QLED TV is integrated into the decoration of your home naturally. Instead of seeing a black screen, you can enjoy images adapted to your lifestyle. It is very easy to configure through the SmartThings app and has many options. Automatically log in to your accounts with simple, seamless smartphone* connection and setup. Only Samsung can offer comprehensive set-up in just a few simple steps. Your TV and mobile will automatically connect and your mobile will share your Wi-Fi link with the TV. If your mobile is linked to a Samsung Account, it will automatically be shared with your TV: no additional login required.